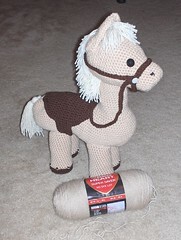 In other news, the pony has been sucessfully completed! There he is, standing by a skein of Red Heart super saver for size comparison. Counting the ears, he’s 19 1/2 inches tall! Woohoo! Now, all I need to do is find someplace non-dusty to stash him for two months! 😆 I’ve been irresistibly inspired by this project: in the future I can see horses and huge toys of my own design appearing here. But for now, I’ve got a bit of a problem. ← What the – where did my week go? first of all, that pony is frickin hilariously cute! wow!!!!!!! I just wanted to drop in and say the llama is a big hit – he’s sitting on my desk at work because I can’t seem to actually part with it and send it on to my nieces! Check out the skinny scarves @ http://www.interweavecrochet.com. They are quick and really cute in the ribbon yarn. I made one for my mom and I think she’ll like it because she can unwrap when she gets a hot flash!! I am going to show my granddaughter (4 yrs) your blog. She loves horses. I think she will be duely impressed that one can be crocheted.